In our previous posts, we discussed how you can limit the number of deliveries for date and time. In this post, understand the impact of WooCommerce order status change on Delivery Date and Time in Order Delivery Date Pro for WooCommerce plugin. For example, you have online watch shop where you can only deliver 20 watches for a day. 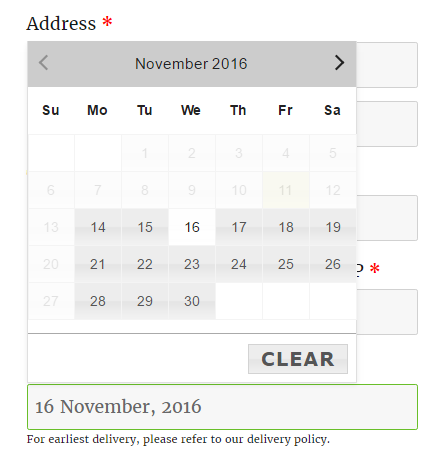 And you want that the date should be disabled for further deliveries in the calendar after 20 orders have been placed for a date. But if any customer cancels the order or asks for a refund for any reason, then you want that the delivery for the delivery date selected in the order should be available in the calendar on the checkout page. This feature works automatically from the plugin without any settings which need to be enabled. Once the maximum number of orders are placed for a date, the date will be disabled in the calendar for further deliveries with a label as Booked. 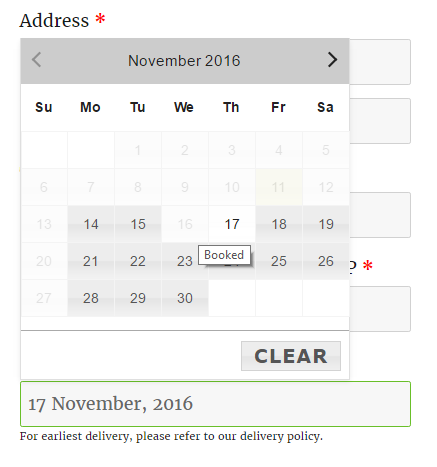 For example, if maximum orders per day are set to 5 and on 16 November 2016 5 orders are already placed, then the date 16 November 2016 will be disabled in the calendar with Booked label. Now if an order status is changed to cancelled, refunded, failed or the order is moved to trashed on WooCommerce -> Orders page. The number of orders placed for the date 16 November 2016 will be reduced by 1. So for the date 16 November 2016, one order is cancelled, and the date will now be available for 1 more delivery in the calendar on the checkout page. In this post, we saw how the delivery date will be available for further deliveries when the order is cancelled, refund, failed or trash. This feature is useful for all the types of businesses who can deliver only some number of deliveries per day.